The Cubs are hoping Marley is right, but there was no sign of any turnaround on Sunday. Jon Lester surrendered 10 runs in the first inning of the shortest start of his 12-year career, and the Cubs stumbled to a 14-3 loss to the Pittsburgh Pirates. Chicago (43-45) heads into the break with a losing record for the first time since it was 40-54 in 2014. The reigning World Series champions also trail NL Central-leading Milwaukee by 5 1/2 games after the Brewers held on for a 5-3 victory against the New York Yankees. The Cubs were 53-35 at the break a year ago. Francisco Cervelli matched a career high with five RBIs and Jordy Mercer drove in three runs as the Pirates closed out a 5-2 road trip with their fifth win in six games. All-Star Josh Harrison homered in the ninth and Chad Kuhl pitched three innings of one-run ball in an emergency start after Jameson Taillon was scratched due to flu-like symptoms. Cervelli hit his third career grand slam into the basket in left with two out. McCutchen followed with a drive to left-center for his 17th homer, chasing Lester and drawing a smattering of boos from a frustrated crowd of 41,604 at Wrigley Field. 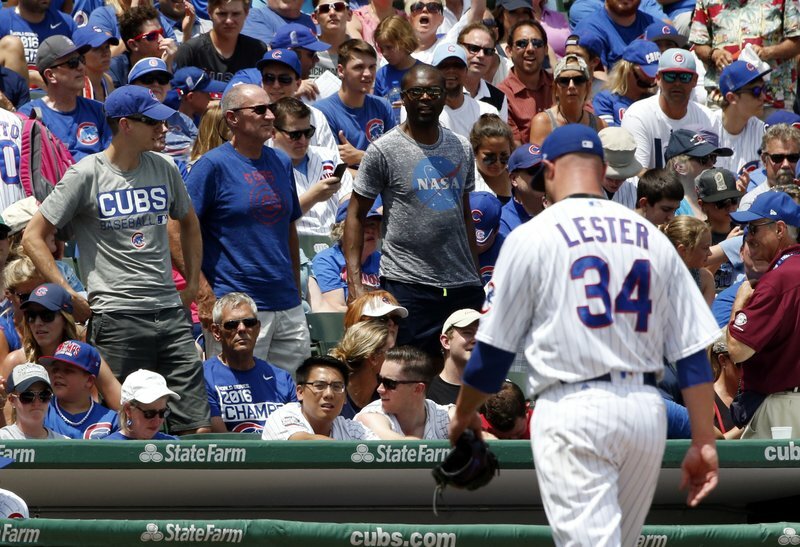 Lester (5-6) was charged with four earned runs and six hits. He also struggled in his previous outing, allowing six runs in five innings in a loss to Tampa Bay on Tuesday. The left-hander was hurt by an error on third baseman Kris Bryant, who booted David Freese’s one-out grounder with runners on first and second. Josh Bell then hit an RBI single, Jose Osuna doubled home two more runs and Mercer made it 5-0 with a two-run single. “If I make that play, the game is completely different,” Bryant said. Kuhl allowed two hits and walked three on just two days’ rest after he pitched a career-high seven innings in a 6-3 win at Philadelphia on Thursday night. A.J. Schugel (1-0), the second of three Pittsburgh relievers, pitched three innings for the win. The Pirates (42-47) improved to 5-1 at Wrigley this year and stayed seven back of Milwaukee. They were 46-43 at the All-Star break last season. Taillon had intense flu-like symptoms when he got to the ballpark and was visited by paramedics, according to Pirates trainer Todd Tomczyk. He felt better after a while, but the symptoms returned while he was warming up. “I think we can all attest to the warrior mentality that Jameson has, the competitor that he is,” Tomczyk said. The 25-year-old Taillon is 3-1 with a 1.98 ERA in five starts since returning from surgery for testicular cancer. Cubs rookie Victor Caratini entered before the Pirates batted in the fifth and went 3 for 3 with two doubles. He snapped a 0-for-9 skid to begin his career. Pirates: Cervelli was shaken up after he was hit on his left leg by a pitch in the third inning, but stayed in the game. Pirates: RHP Gerrit Cole (7-7, 4.43 ERA) is scheduled to start Friday night in the opener of a three-game series against St. Louis. After the Cardinals leave town, the Pirates host the Brewers for four games. Cubs: LHP Mike Montgomery (1-6, 3.75 ERA) will start Friday night’s game at Baltimore. Montgomery replaced Lester and allowed two runs and three hits in three innings.